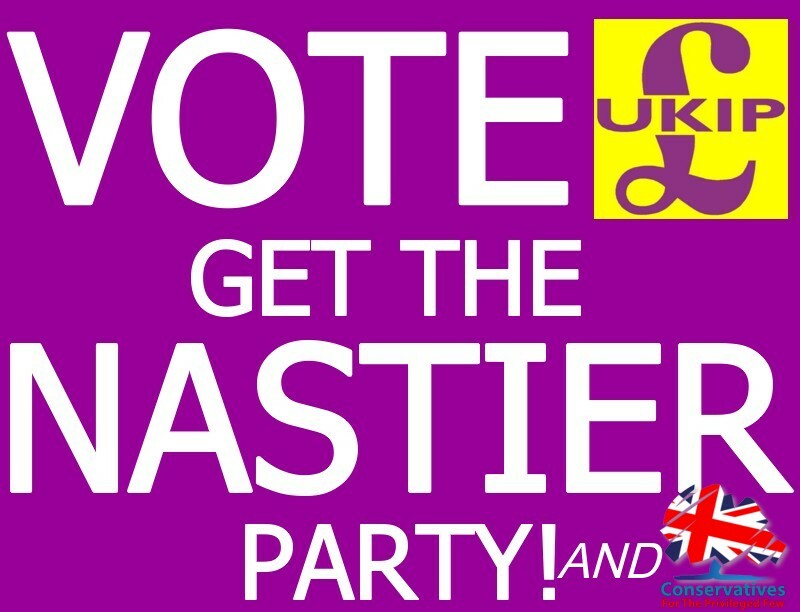 POLL: UKIP to prop up Tories in order to get EU referendum? Purple Tories: If the Daily Mirror is correct, then Nigel Farage has confirmed that a vote for UKIP will also be a vote for the Conservative Party at the 2015 general election – IF the Tories agree to rush an in/out referendum on the EU out to the public that summer. According to today’s (Monday) Daily Mirror, Nigel Farage has admitted that UKIP will merrily support a Conservative government after next year’s election – if it gets the necessary number of MPs – if David Cameron holds his promised in/out EU referendum next summer. The announcement should not come as any surprise, even though Farage himself has claimed he would never do a deal with the Conservative Party. Most of UKIP’s leading members are former Conservatives and the party has a wholly right-wing agenda. Many commentators have expressed the belief that UKIP would join the Tories in government if they had the chance – now Nigel Farage has named his price. Why not? David Cameron offered a bribe to the electorate at the Tory conference a couple of weeks ago – why shouldn’t UKIP expect him to bribe them as well, if that’s what it takes to stay in power? According to the Mirror, “Labour said his comments on a hung Parliament come as no surprise. “’UKIP is a party joined at the hip to the Conservatives by Tory policy, Tory politicians and Tory money,’ blasted Shadow Cabinet Minister Michael Dugher. “So I want to make something very clear today. If he can lie, why not Farage? Mike, I think the poll question has not been finished off? Thanks for that – it’s because the poll-writing app only accepts a certain number of characters. I was writing – in a hurry, as usual – late last night and didn’t realise I’d gone over. I’ve changed it now. Thanks for alerting me. Well the mirror has always been staunchly labour seems strange that they have veered away from the vote ukip to get labour idea presented by the tory party supporting rags and are saying they expect the tories to get enough seats to form a coalition with ukip. The truth is being independent of the party that gets the power is better than supporting it for a crumb from the table. They’re not saying that at all. They’re saying Farage has promised to support a Tory administration if UKIP gain enough seats to make that possible. Big “if”, that. I agree with your last sentence. The Liberal Democrats should have realised that, five years ago. Well, there you go then! Farage knows he cannot get enough MPs in the election to form a government, but he also knows there is a slight chance that if there was a hung parliament, and his party had enough to tip the balance, (although he says he would not make a coalition with the Tories), he is bribing them to take the heat off, by saying he would however, support them if David Cameron holds his promised in/out EU referendum next summer. Just shows you they are all in it together in their machinations of the election ! Labour is on track to win as a minority government in 2015. As Labour said in one by-election they won, even if they lost most of their majority to UKIP. It’s winning that counts. The Tories are coming third and the Lib Dems are being wiped out in by-elections. What UKIP is saying is that price of a coalition is an in/out EU referendum in July/August next year. Ask No2EU that was endorsed by the late lamented Wedgwood Benn about Europe, and Podemos in Spain. I say no more, than for the poor the EU is a catastrophe. But Europe is not important to most UK voters (the few that are left, and the fewest who will vote in UK history in 2015). So what if UKIP and Labour rule in coalition next year. Labour will have the bulk of the MPs in government, to only a handful UKIP MPs. Labour and UKIP will not make a coalition. The Mirror’s assertion is entirely inconsistent with the content of an article about the same subject published by The Torygraph over the weekend. Tghe article also carries a similar claim by Sky News that no such deal is on the cards. Now which side – in the name of Brooks Newmark – is one likely to believe? That’s why the article makes it clear that the Mirror has made the claim. I’m not asserting that it is a fact, and the poll asks readers what they would do if the claim is correct. Tory, Labor, Lib Dem, and UKIP (aka new Tory). Talk about a lack of options. Are you saying they’re all the same? If so, has Lynton Crosby paid you to say so? For one they all wear different ties. Yet they’ll all keep going with the same old tired sh#t they have tried before even though it’s been time proven as a complete and utter failure. And who the fk is Lyton Crosby anyway? Lynton Crosby is the chief election campaign strategist for the Conservative Party. He reckons getting everyone who’s not a Tory to think that all the parties are the same, so it’s not worth bothering to vote, will ensure victory for the Tories next May. I like this one Mike! UKIP are the same as the Tories but worse, and the Liberal Democrats are untrustworthy weasels who will hopefully lose out big time.